The point behind the Make Up For Ever HD range is that it should be "invisible on HD cameras and to the naked eye". I agree that it is invisible on camera - Make Up For Ever had an "Untouched" campaign that both highlighted their unfavoured stance on Photoshop post-production and equally showcased their HD products. I recommend you take a look (here) as it is genuinely interesting to see what untouched photographs can look like with good makeup products, applied well. I'm not terribly convinced that it's invisible "in the flesh", but more on that in a bit. Skip down to "The Foundation" below if you prefer! With the advent of high definition (high-def/HD) video, changes in makeup were necessary. Older formula makeup, up until then more than sufficient for covering blemishes, pigmentation, redness, fine lines and wrinkles, enlarged pores, moles, tiny facial hairs, pock-marks, port wine stains... no longer worked to cover and conceal all of those lovelies in high def film. In addition, HD video clearly showed up "aging makeup" used on actors. HD, while a wonderful way of showing new levels of definition and detail, includes all those lovely details we use makeup to hide, to camouflage, or to alter. There are a few different ways to get around makeup for HD video - one is the tried-and-tested airbrush method, which uses a misting gun which sprays a super-fine stream of makeup that is used to literally "air-brush" the face into submission. Another way is to use products that are specifically formulated for HD. Make Up For Ever possibly the first company to produce HD-specific makeup, back (I believe) in '07 or '08. By-and-large, this involved changing around the formulations of the makeup; using microsphere pigments, using extra-finely-milled powders, using a lot of ingredients that give a soft-focus finish to the face. Cue much use of silica, and silicones. According to Make Up For Ever, the HD foundation is "an oil-free medium-to-full coverage liquid foundation which covers skin imperfections, while remaining invisible on-screen and in real life. Its extremely fine texture is supple and easy to apply. Enriched with moisturizing agents, it leaves the skin soft and radiant". So what did I find? To be 100% accurate I should talk about this foundation from two perspectives - both from the perspective of normal, "in the flesh" appearance of the foundation, and also from the perspective of HD video. As I haven't worked in HD, I can't comment from that point of view, so this review is only from the former perspective. Per the brand, this is a medium-to-full coverage, buildable foundation. I agree that this is a medium coverage. It builds reasonably well also, it certainly does layer well from an application perspective, but it can looks more and more like "makeup" on your skin, the more you apply. But then that's true of all full-coverage finishes. It doesn't really sheer-out particularly well (but that's really not what it's intended for anyhow). It has a very definite "foundation" look on the skin; fine if that's the look you're going for, but a natural foundation it ain't. This has quite a nice soft-focus semi-matte finish to it; it's also far from a natural finish ("in the flesh"). As described under Coverage above, it's definitely got a "makeup" finish to it. In other words, if you want a foundation that looks like you're wearing nothing, then don't pick this one. I personally get around eight-to-ten or so hours out of this. I definitely need to powder my slightly oilier t-zone area. Where this foundation really really comes into its own is when it's paired-up with the Make Up For Ever HD Concealer for under-eyes, and then followed up with a dusting of Make Up For Ever HD Powder - this is a 100% silica powder which is milled so incredibly fine that it is like smoke - and in fact it gets right up your nose as you apply it! The three of these products, combined, give a beautiful, if "made up" look, but definitely an elegant, flawless, soft-focus, airbrushed look. In the same manner as with the last Make Up For Ever foundation review I did (Mat Velvet), the shade numbering scheme is annoyingly confusing and inconsistent. OK, this is not a huge deal as long as you go in-store and get properly colour-matched. I have found that some friends of mine have complained that this foundation oxidises quite noticeably and turns darker on their skin, however I personally haven't found this to be the case. I am around NC23-ish and I'm using #125, which is a reasonable match for me at present (although in general I prefer a more yellow undertone, #120 is slightly too dark for me and #123 has a more olive than yellow undertone). Make Up For Ever recommends using either of the nylon flat paddle brushes "designed for use with their HD range" (the 20N and 35N). I can't disagree more. Personally, I have found that these brushes are too plasticy and leave streaks. I can see why they recommend nylon fibres however, as natural fibres just drink up this foundation. Personally I've found that a Taklon flat paddle brush (moisturised lightly first) is best for this foundation, finished-off by pressing your hands all over your face to eliminate lines and streaks. Dry sponges, stippling brushes, natural fibre brushes don't work particularly well with this foundation. Fingers work well. A soft, damp brush is not a bad alternative. Buffing brushes, providing they are synthetic, and providing you don't have dry skin, are fine. This is an oil-free fluid foundation and a very small amount really does goes a long way - assuming that you're not using natural fibre brushes or dry sponges - one to one-and-a-half good pumps should do the trick nicely for medium coverage. It contains ingredients heretofore not seen in makeup - such as Focogel (designed to form a barrier between your skin and the foundation - necessary as the pigments are now so tiny that they run the risk of clogging pores) and Sericite (which enables light to bounce back more readily from the face, which contributes to the soft-focus effect). It also contains mica, talc, lots of silicones, parabens, hydrolized yeast proteins (careful if you're yeast-sensitive) and some of the shades contain titanium dioxide. Those with normal-to-combination skin will benefit from this foundation. It can exaggerate dry skin patches however (but this is true of all foundations that are not specifically intended for dry skin types), so make sure that you're well moisturised if you're using it. A primer (silica- or silicone-based) is a good idea with this foundation; although not strictly necessary, it furthers the soft-focus effect of the foundation overall. It's designed for HD video, so bearing that in mind, it should nicely on more mature skins, as it really does a vanishing act on very fine lines. 30ml of this will set you back €39.50 in Make Up For Ever Clarendon St. According to my research, this has no SPF. The ingredients list contains a reference to titanium dioxide (likely for the very palest shades), and as this can cause flash-back in flash photography. This review is only basing this on my own use; this is not a foundation I have in my kit, it's one I've used on myself only. Caution is needed with the HD powder, as it really can cause flash-back in photography if you're not beyond careful about blending and buffing it into the skin. 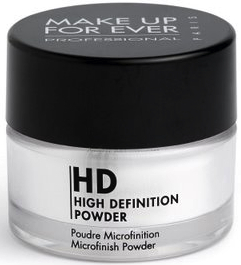 Don't forget however, that this foundation and powder is intended for HD video. Not flash photography. So don't fault it for that reason! Do I recommend? Yes - if you have normal-to-combination skin, if you like a medium+ coverage semi-matte look and if you don't plan on being photographed, this is a beautiful foundation that really does even everything out.